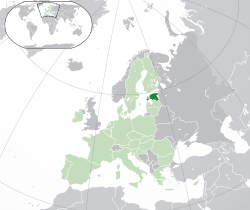 According to the Constitution, Estonian is the sole official language. In southern counties, Võro and Seto are spoken along with it. Russian is still unofficially spoken in Ida-Virumaa and Tallinn, due to the Soviet Union's program promoting mass immigration of urban industrial workers during the post-war period. SDE member but nonpartisan while in office. 47,549 किमी2 (5.11813176404×1011 वर्ग फु) were defined according to the Treaty of Tartu in 1920 between Estonia and Russia. Today, the remaining 2,323 किमी2 (2.5004563898×1010 वर्ग फु) are still occupied and part of Russia. The ceded areas include most of the former Petseri County and areas behind the Narva river including Ivangorod (Jaanilinn). Pechory remains under Russian control. Estonian kroon (EEK) before 2011. ↑ "Population and housing census – Population and Housing Census 2011 – Preliminary data". Database Update 17. Statistics Estonia. पहुँचतिथी 16 जनवरी 2013. ↑ "Statistics Estonia". Stat.ee. 1 जनवरी 2014. ↑ "PHC 2011 RESULTS". Statistics Estonia. पहुँचतिथी 16 जनवरी 2011. ↑ 4.0 4.1 4.2 4.3 *अप्रैल 2014 Edition, Gross Domestic Product per capita, current prices, U.S. dollars.